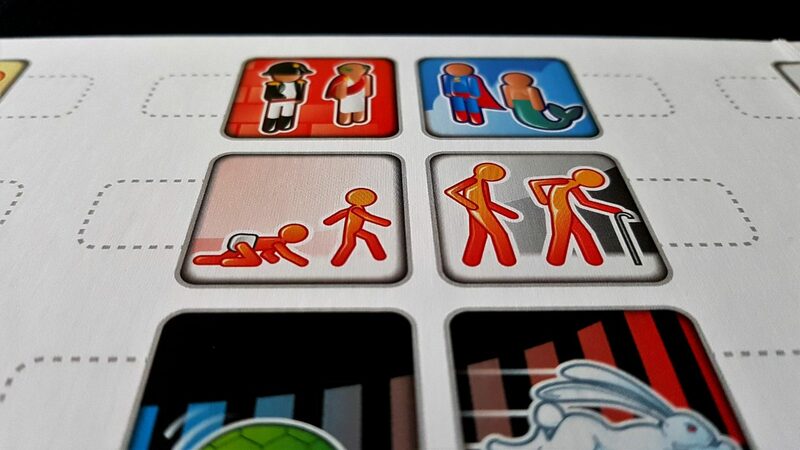 Concept is about as competent an execution of Charades: the board game as you could hope. It’s fundamentally sound. It’s a three star game if you listen to us, and there’s no reason at all why you shouldn’t. Look – who couldn’t believe a face like this? 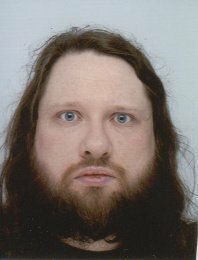 This is, swear to god, my passport photo. It looks like the mug-shot from some grisly mass-murder. I know, right? Believability and charm oozing out of every pore. You’d buy a used house, a used car and a used dog from someone with a face like that. 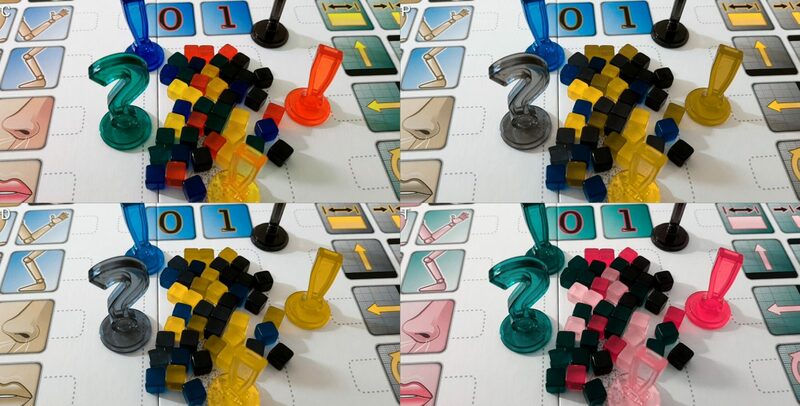 Concept has definite charms, and it wouldn’t surprise us one bit to know that you would like to play it. Could you though? Should you though? Let’s find out. Colours are likely to be something of a problem because there is a whole side of the board given over to icons that can be used to represent the palette of the object, thing or concept you’re trying to demonstrate. It’s okay, how important is colour anyway? All categories of colour blindness are going to have some problems in dealing with this. Each card though gives you multiple choices and in many cases it’s possible to pick something you’re going to represent that has no meaningful colour information to go with it. It does though lock you out of a number of useful tools for narrowing down your definition. If you’re on the guessing end if someone makes use of these colours the clues they give might well end up being somewhat misleading. I don’t even know what the answers are. Does this snippet from the manual work for you? Do the clues shown impact on your ability to work out the concept being illustrated? Your answer is a more useful guide than my observations here. The game comes with numerous different coloured tokens to represent concepts and sub-concepts, but I have my doubts how useful this is. It is a situationally powerful tool for which you will rarely find a use. It’s hard enough keeping a single chain of concepts going without adding in new ones and subsets thereof. 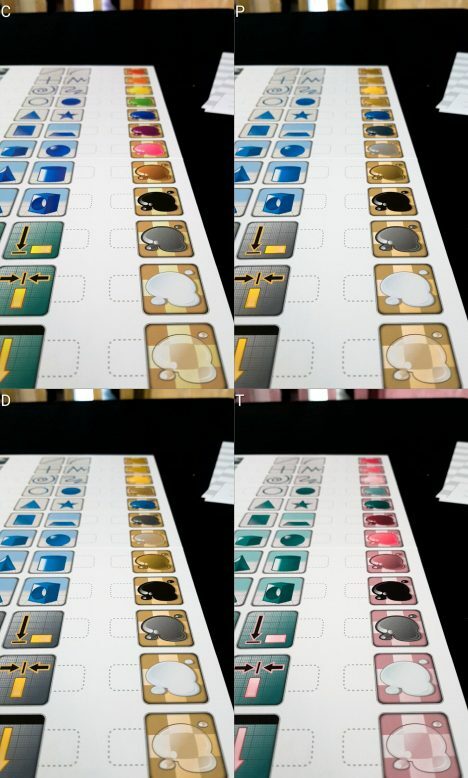 However if this a tool you need you’re going to be limited by the categories of colour-blindness represented around the board as to how many sub-concepts you can meaningfully work with at a time. Don’t fret it – you’re going to have enough difficulty making use of one concept. 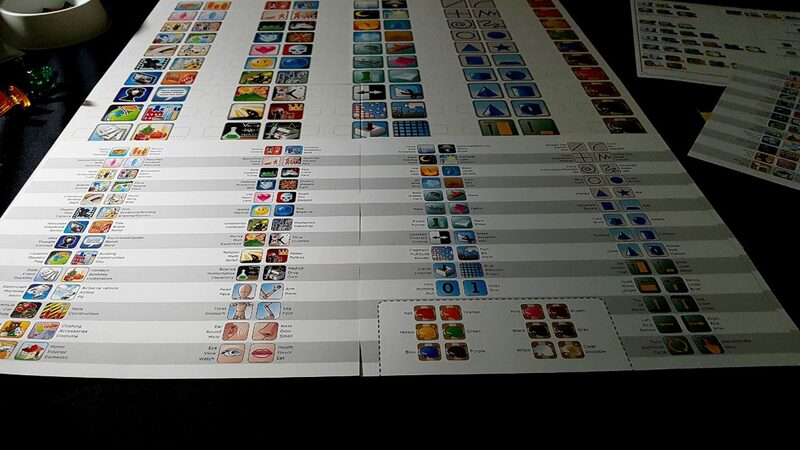 Otherwise colour is not a serious issue – each of the icons on the board have their own distinctive art and you get a ‘cheat sheet’ that shows common interpretations of each of them if you care to use it. I think I have it – it’s the bleak inevitability of failure, right? Really here, our recommendation is tentative only because I genuinely don’t know how big of an issue colour blindness is likely to be. I would be very grateful if any readers with direct experience could get in touch via the comments. Consider then the number of tokens you might make use of across the board, and the specific subtle interrelationships between them. Then consider the implications of spatiality – it might mean something that cubes are arranged in a particular way, or there being four as opposed to three. Even how they are physically placed on the board might be important. Everything is fair game in Concept, meaning that if you want you can use tokens to cover up parts of icons, or place them in particular overlapping configurations to represent conceptual harmonies. All of that is visual information. Many of the icons too are very similar in their broad silhouettes. The board is very well contrasted though – a bright white against which all colours of tokens and symbols are easily differentiated. 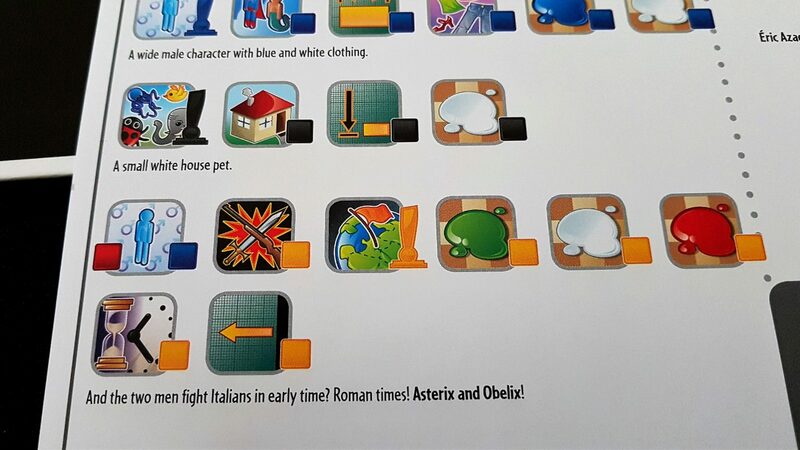 Close examination of these icons is likely to be an important part of play, and this is probably being done in an environment where everything is changing. When a token is placed down, it doesn’t need to stay there – it can later be moved, or entirely removed. The motion between one icon to another may be meaningful. If you wanted to represent ‘cooling’ you might drag a cube from ‘hot’ to ‘cold’ a few times to show people the nature of the transition. While people are puzzling over your current setup you might be adding new nuances. Or removing existing nuances. Or changing emphasis by altering previous tokens. You might even wipe the board clean and start again. The Concept board is a febrile place. There is an extent to which tactile investigation of the board is possible but it’s unlikely to be a particularly feasible solution. Placement of tokens is important, and it’s easily disrupted. Binocularity too is an occasional issue since the depth at which tokens are placed, and their relationship to each other in three dimensions, might be meaningful information. It’s certainly possible to play a fun game of Concept without taking full advantage of the spatial explicitness of the board. That’s almost certainly going to have to be the case if playing with a visual impairment, or with players with visual impairments. 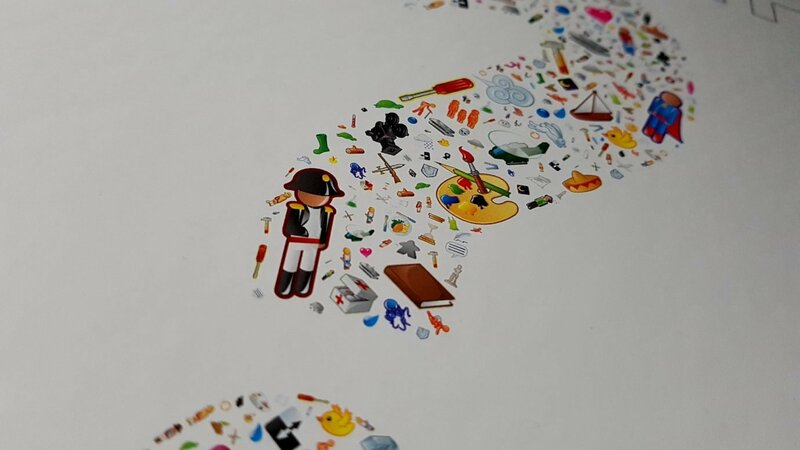 However, even putting that to the side doesn’t remove the fact that it’s an ever shifting visual landscape of tokens and icons and occasional moving parts. As such, we don’t recommend Concept in this category, but as is often the case if you really want to play it you almost certainly will be able to come to some accommodation. This game puts a lot of stress on cognitive abilities, especially those relating to creativity and language. Similarly to Dobble, the Mind, and Once Upon a Time the issue here isn’t in the difficulty of the rules (there isn’t much), but in the challenge of the task itself. It gives you a board of possibilities, and lets you bang them together in any way you like to meaningfully communicate a relatively complex concept or task. That is difficult. You’ll spend more than a little time staring at the board, wondering how you even start something like that. There are some words that are going to be easy to do. Mountain for example – that’s a rock (for which there is an icon) and its tall (for which there is another icon). That’s probably going to be okay for most people. At that same difficulty level though is Pirate, and tow truck and Little House on the Prairie. Those are far more challenging. If you’re guessing, the task is also very difficult. It requires you to rifle through your whole mental catalogue of ‘everything in the world’ and filter it down based on ambiguous and often temporary (mis)understanding. This is burdensome in terms of fluid intelligence and memory, and burdensome in the most problematic way. It stresses recall over recognition. More than even this, the meaning of the symbols will change from person to person. Everyone will approach this open puzzle of communication in a different way. Some people will be strict literalists. Some will be metaphorical. Some will approach it as an entirely abstract task of symbolic representation. And as the different styles shift in and out of play, you’ll need to keep track of the different context. Just remember, ‘large’, ‘fire’, and ‘person’ can mean entirely different things for entirely different people. That’s the whole point of the game. There is an expectation that players have an understanding of general knowledge, and some pop culture. There are many celebrities, television shows, and other societal touchstones represented through the deck. There is a ‘very hard’ concept that says ‘Fidel Castro (Ruz)’. I don’t even know what that Ruz means. I assume it means ‘Also accept Ramon Castro’, but I only assume that because I know he was Fidel’s brother. One concept is ‘Laika’, which requires everyone to know that she was one of the first animals in space. One concept is ‘Knights of the Zodiac’, which I only know because I looked it up on Google. Much as with a more free-form game of charades, Concept is all about a consensus on cultural relevance. The symbolism throughout the board is also likely to be a problem when setting and interpreting clues. You get a ‘cheat sheet’ of meaning, if you want it, but whether that’s what the symbols actually mean in practice is going to depend on the ‘metagame’ in which everyone is participating. This is what the icons mean. In theory. Adopt a convention that the first token you play is always the type of thing, just like in charades. ‘Book’, ‘Movie’, ‘Person’ and so on. That hugely restricts the possibility space within which you’ll need to mentally wander. Put together a bespoke deck of ‘simple’ words. Perhaps even develop your own, focusing on things that can be described literally rather than metaphorically. ‘Monkey’ is fine, ‘infomercial’ is not. ‘Gloves’ would be okay. ‘Infrared telescope’, not so much. Again, these are actual examples on the easiest difficulty. Rather than having everyone guessing at once, have people guess in turns, or permit a ‘grace period’ for each person to guess before everyone else gets to pile in. Concept in and of itself is a perfectly reasonable proposition for all categories of cognitive impairment, provided you are willing to make a little effort to make sure you limit just how wild and inventive the concepts you need to represent will be. As such, we offer a tentative recommendation for Concept, if and only if you’re going to make some effort to turn it into an accessible variant. If not, we strongly recommend you avoid it. Everyone stared blankly at the board. She picked up the ‘rich’ token and tapped it repeatedly against the icon. We continued to stare. Then she did the same with ‘costume’. She was getting frustrated, we were getting frustrated. What the hell was she trying to represent? A rich man in a costume? Donald Trump? An animal in a costume? It’s Donald Trump, isn’t it? But no. At a certain point, short of passing, all you can do is keep gesticulating at the same set of incomplete information elements until inspiration strikes. Then she placed another token on ‘black’, and suddenly it clicked. And yes! Of course it’s Batman. Now it’s obvious. I couldn’t have been farther away from Batman in my mind before she played the last token. And when I knew it was Batman, I instantly felt very stupid for not having seen it before. The recrimination associated with sub-par play is funny and enjoyable, in the right group, with the right personalities. It’s what makes people laugh. But you know – they’re still laughing at you. They’re still laughing at your failure, either to meaningfully express or to meaningfully interpret. To be fair, this is likely to be a shared failure but when you’re the person (or persons) placing out the tokens the spotlight is on you. So here’s the question you need to answer – how does your group handle a Pictionary loss? Concept has that element of emotional inaccessibility in its DNA. If the answer is ‘with good grace’ then sure – Concept will be fine. If it is ‘Not well’, then perhaps walk on to the next game. We’ll offer a tentative, conditional recommendation for Concept in this category. It’s probably obvious from the review that precision of placement is an important element of Concept, as is being able to physically represent transitionary elements. As such, physical accessibility is a consideration. There are a lot of cubes, and you’ll often be parcelling them out in small collections, in different combinations, and with meaningful subtlety in terms of the spatial parameters. If the precision of fine-grained movement is an issue, Concept will be somewhat problematic to play. As such, the game rules pretty much mandate verbalisation not as a possibility, but a core element of the rhythm of play. I haven’t seen that before. It’s nice! There’s a reason why we talk about verbalisation as an option and not as a default solution to the problems that come with physical inaccessibility. Where possible, people generally prefer to act on their own behalf, and that’s the ideal state for board games. When relying on verbalisation for a game that shouldn’t need it, the message sent is ‘I can’t play this game properly’. That can be stigmatising, and many people will just as soon choose not to play the game as a result. It’s the same psychology behind kids refusing to wear glasses, or older adults refusing to get a necessary hearing aid. It marks someone out as needing extra help, and it makes many people feel uncomfortable – certainly in groups with people they don’t already know very well. Verbalisation is a compensatory strategy, but it shouldn’t be the default one. As such, when a game like Concept endorses verbalisation in its rules, it removes the stigma entirely because you are playing the game as it is intended. This is lovely. As a result, we recommend Concept in this category. You’d need to be of a very sensitive disposition to feel particularly aggrieved at anything in Concept. There are some elements that might rankle a little, but they are very rare and minor. 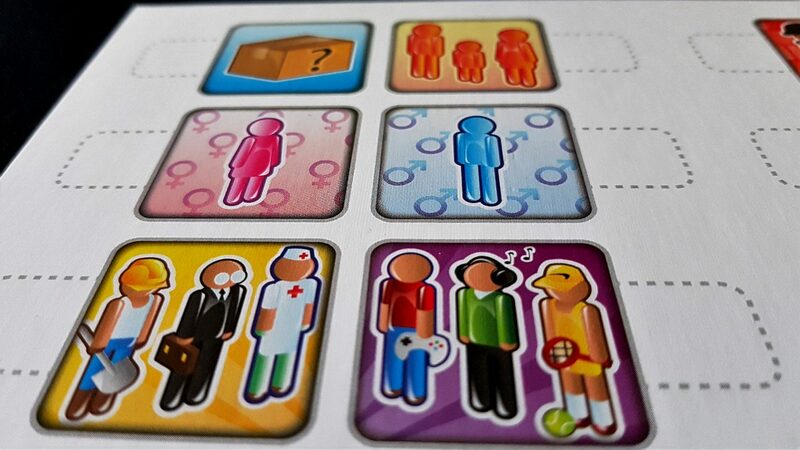 The male and female icons use gender-coded colours, for example. The cards every so often default to masculinity in proverbs (such as in ‘a frog in his throat’). The icons for the various human groupings show white complexions with no variation. The symbol for ‘old’ shows doddering decrepitude that is out of sync with an accurate or respectful portrayal of age. That’s the sort of thing – if you wanted to get worked up about it you could, but I think you’d really need to want it given how you’re looking for these icons to be as simple as possible. Complex representation here would just muddy the waters – a dynamic old woman on a skateboard might be an ‘age positive’ representation of active older adults but you don’t want people thinking ‘skateboard’ when you place down that cube. That’s not to say it couldn’t do better than it does in some ways, just that the problems are minor. At an RRP of £30, it’s not a bad deal – but even with the 100+ concept cards available you’re going to find yourself running out before too long. The good news is that like a game of charades there’s nothing to stop you just making up your own as you go along. That’s almost certainly going to be the modus operandi of a group regularly getting this to the table. It’s extremely flexible with player count too – the box sets a floor of four but really you can play it with two if you like. Four is for the ‘rules proper’, which don’t need to be followed. The box also says it goes up to twelve but you can have as many players, and as many teams, as you like. The manual permits, and even encourages, flexibility. ‘Just have fun with it’, it says. We strongly recommend Concept in this category. While Concept doesn’t require much in the way of communication, it does require a bit – it is going to need players to be able to identify the concept for one thing, and it’s going to need a degree of literacy (strong enough to deal with idioms and metaphors) when reading cards. More important than this though is the requirement the game has for metaphorical fluency in expression. You are rarely able to describe a concept in terms of physical properties alone. There are some that do work that way, but far more often you’ll need a degree of abstract thinking. Consider the phrase ‘forewarned is forearmed’ – that’s going to need some creativity in representation. That in turn requires everyone around the table to understand the linguistic and symbolic conventions you’re adopting, and to understand where literality may be intended. You might begin this particular phrase by placing four cubes on the ‘arm’ icon. ‘Four arm’. That’s quite good, but are people going to understand the use of homonyms? ‘Down the wrong hatch’ is another example – you can probably communicate that literally but if you want someone to get the intention, which might help with the meaning, you might want to attach something representing ‘food’ and ‘choking’. That means you need to understand the meaning behind the phrase. As with physical accessibility though, the assumption of team-play can mitigate some of these issues if communication within pairs is possible. We’ll offer a tentative recommendation, just, for Concept in this category. The requirement for conversational fluency and appreciation of idiom and subtlety of language is not trivial, but it is otherwise possible to play without speaking or listening, beyond the ability to indicate an answer. Curation of the deck, or creation of a custom deck for players, can also help mitigate some of these issues. The nature of the collaborative team element in play eliminates numerous intersectional issues. For example, the cards often refer to concepts that may not have universal traction, but the risk of this is reduced when multiple players can confer about meaning. The design of the game too alleviates this to an extent, since you can pick between three options at each level of difficulty. That means that when you get ‘Ennio Morricone’ you can decide within the team ‘We don’t know who that is, so let’s go for Hopscotch instead’. In other words, the game has hidden hands to an extent but manages to solve the issue of these being kept secret. That hugely simplifies thing on the visual and cognitive impairment spectrum. The game has no formal time constraints, although these are often adopted for the sake of ensuring brisk play. There is no meaningful downtime, since everyone is involved in every round – either playing clues or guessing. As such, emotional and cognitive intersections associated with attention and frustration are not a problem. While the board does require a degree of precise placement of tokens (an issue for intersections in the physical and visual categories), the assumption of team mode deals with this to an extent. 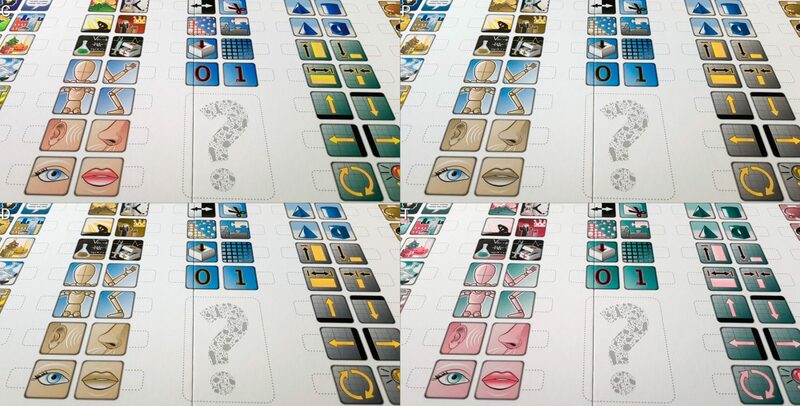 The most significant intersectional issue comes from not playing clues, but guessing them – the game is one that puts a huge emphasis on symbolism, and that’s going to exacerbate accessibility issues for those with visual and cognitive impairments. 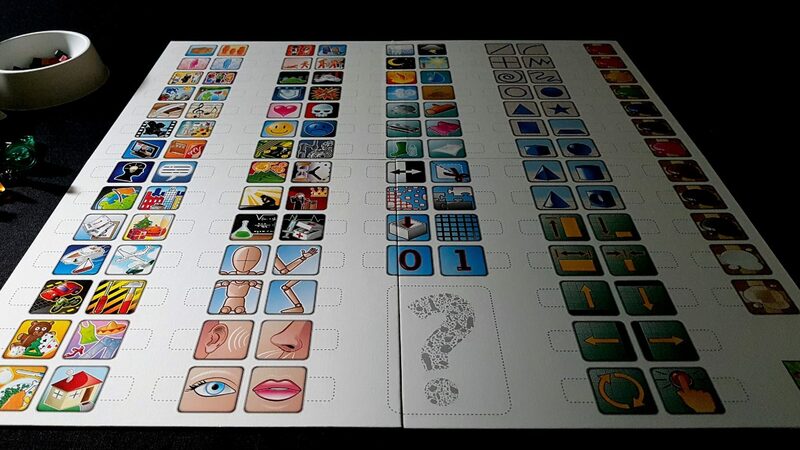 While we recommend the game for those with cognitive impairments only, if they intersect with visual impairments we’d be even more inclined to suggest you look elsewhere for a less problematic game. Concept supports relatively easy dropping in and out – while it allows for points to be accumulated, it advises simply engaging in the fun of the activity itself. As such, if a player feels the need to excuse themselves from play it needn’t interfere with an ongoing session. Some flexible accommodation of numbers may be required if play drops below four players, but there is always a route through it. The’ ‘team play’ element at the core of Concept isn’t explicitly an accessibility aid, but it manages to improve the accessibility scores the game receives in a number of categories. It’s still not a hugely strong performance, but it would have received much lower grades for physical accessibility and communication were it not a feature. The cognitive category too would have a lower score if this were not permitted as part of playing clues. It is very nice, and non-stigmatising. We like that a lot.